That’s the U.S.A. But our poet Carol Heuchan, on her fifth performance tour, saw the other side as well. 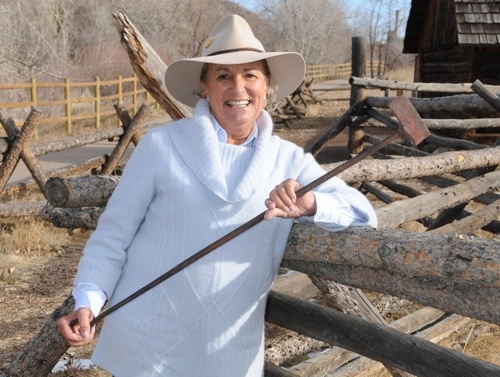 She went out on real working ranches where they still use big horse teams to take hay out to cattle on winter pastures. 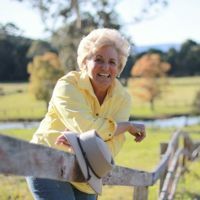 Carol started (after travelling for thirty four hours) with concerts and workshops in schools in Colorado, then a television show in Denver, cracking the stockwhip and doing Man from Snowy River bush poetry. They call it Cowboy Poetry over there and Gatherings are held throughout the ‘western’ states. The first was the Colorado Cowboy Poetry and Music Gathering in Golden, the kick off a ‘Branding Party’ in History Park. All the local ranchers came in and everyone burnt brands into old barn timber which was then used as part of the stage decoration. The entertainers stay in the fabulous Table Mountain Inn – state of the art adobe architecture against the backdrop of the snow clad Rocky Mountains and the concerts are at the Mountaineering Conference Centre and the School of the Mines Auditorium. There’s a big archway over the main street in Golden that says “ Howdy Folks! Welcome to Golden – Where the West Lives” Wow. The Colorado Gathering goes for four days of fabulously orchestrated day and night concerts. Audiences big and really appreciative. There’s Chuck Wagon cooking, brilliant musicians and jam sessions afterwards till all hours of the morning, the camaraderie amazing. A couple more schools and little concerts then it’s adventure time. Staying up in the mountains in Conifer, hiking in National Parks, gallivanting around Denver, wining and dining, shopping and going to the National Stock Show’s big rodeo at the Colosseum in Denver. Then off to Elko, Nevada, staying at the Stockmen’s Casino Hotel for a week for the National Cowboy Poetry Gathering – the biggest one. Main job this time, the Ranch Tours and a couple of smaller concerts. What a time was had. All the performers are close friends and when this get-together happens, it’s like one big fun family homecoming party. And what handsome cowboys! The farewell dance is just grand. 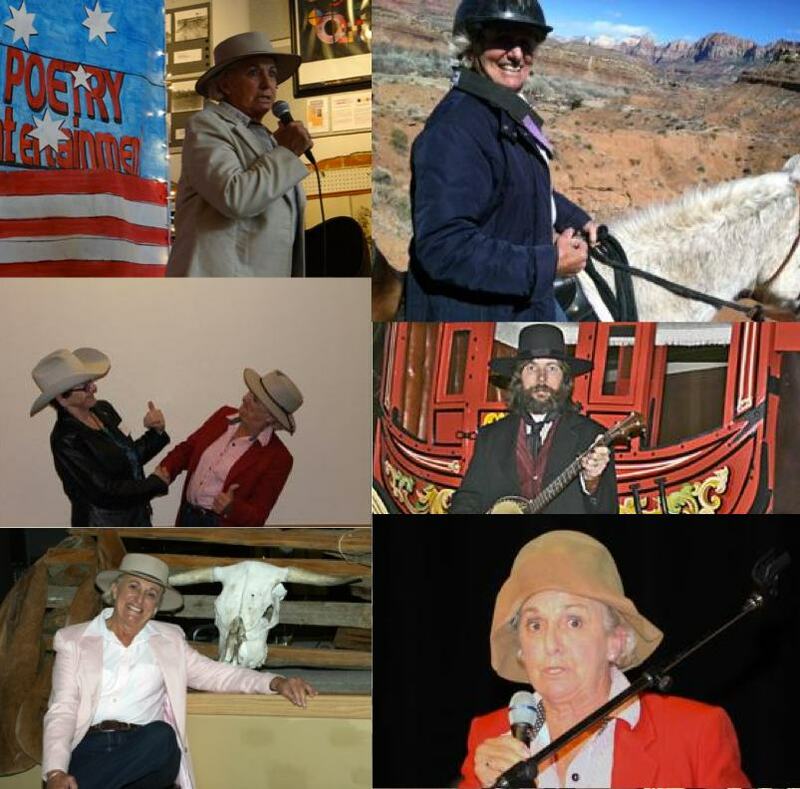 Next stop Apache Junction, Arizona where Carol and Canadian poet, Doris Daley did a concert before heading down for another show and a school on the way to Tombstone. Yep, the real McCoy western town of Tombstone where the thirty artists booked for the Sierra Vista Gathering had the kick off party, performing in Big Nose Kate’s Saloon. Amazing place - one whole wall of stained glass pictures of Wyatt Earp, Doc Halliday, Bat Masterson etc. The organisation of the Cochise Cowboy Gathering in Sierra Vista is daunting. Military precision (it’s where Fort Huachuca is) combines with warmth and excitement . 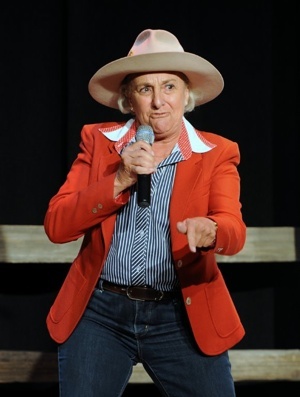 As in Colorado, Carol was featured as headliner performer and the response was great. VIP functions, parties and jam sessions galore. Goes without saying, there’s not much sleep, the plane trip home a welcome rest. Not for long though. Carol’s next big gig is the Royal Easter Show. It’s her fifth year as main arena commentator (for the whole two weeks). Gee that gets her out of some housework.